Often, it takes a combination of factors for a stock to make a big move. For example, it could be a combination of a new product and an important technical pattern. Those two elements could be coming together for Advanced Micro Devices (Nasdaq: AMD). “AMD demonstrated its commitment to datacenter computing innovation at its recent Next Horizon event in San Francisco by detailing its upcoming 7nm compute and graphics product portfolio designed to extend the capabilities of the modern datacenter. During the event, AMD shared new specifics on its upcoming Zen 2 processor core architecture and detailed its revolutionary chiplet-based x86 CPU design. Furthermore, it launched the 7nm AMD Radeon Instinct MI60 graphics accelerator. It also provided the first public demonstration of its next-generation 7nm EPYC server processor codenamed “Rome”. Amazon Web Services (AWS) also joined AMD at the event. Together, they announced the availability of three of its popular instance families on the Amazon Elastic Compute Cloud (EC2) powered by the AMD EPYC processor. “The multi-year investments we have made in our datacenter hardware and software roadmaps are driving growing adoption of our CPUs and GPUs across cloud, enterprise and also HPC customers,” said Lisa Su, president and CEO of AMD. Meanwhile, ZACKS reports that investors in the stock appear to be positioned for a large price move. That is based on the fact that AMD call options recently recorded an unusually high level of implied volatility. Implied volatility shows how much movement the market is expecting in the future. Options with high levels of implied volatility suggest that investors in the underlying stocks are expecting a big move in one direction or the other. It could also mean there is an event coming up soon that may cause a big rally or a huge sell-off. However, implied volatility is only one piece of the puzzle when putting together an options trading strategy. The service notes that, “clearly, options traders are pricing in a big move for Advanced Micro Devices shares, but what is the fundamental picture for the company? Over the last 60 days, three analysts have increased their earnings estimates for the current quarter, while seven have dropped their estimates. The net effect has taken our Zacks Consensus Estimate for the current quarter from 10 cents per share to 9 cents in that period. Given the way analysts feel about Advanced Micro Devices right now, this huge implied volatility could mean there’s a trade developing. The stock has been forming a base in the short term. In the longer term, the stock offers significant potential and could return to the highs seen just a few months ago. As with the ownership of any stock, buying AMD could require a significant amount of capital and exposes the investor to standard risks of owning a stock. For AMD, the December 21 options allow a trader to gain exposure to the stock. A December 21 $23 call option can be bought for about $0.80 and the December 21 $25 call could be sold for about $0.38. This trade would cost $0.42 to open, or $42 since each contract covers 100 shares of stock. In this trade, the maximum loss would be equal to the amount spent to open the trade, or $42. For this trade in AMD the maximum gain is $1.58 ($25 – $23 = $2; $2 – $0.42 = $1.58). This represents $158 per contract since each contract covers 100 shares. 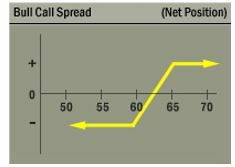 Most brokers will require minimum trading capital equal to the risk on the trade, or $42 to open this trade. That is a potential gain of about 376% based on the amount risked in the trade. The trade could be closed early if the maximum gain is realized before the options expire.